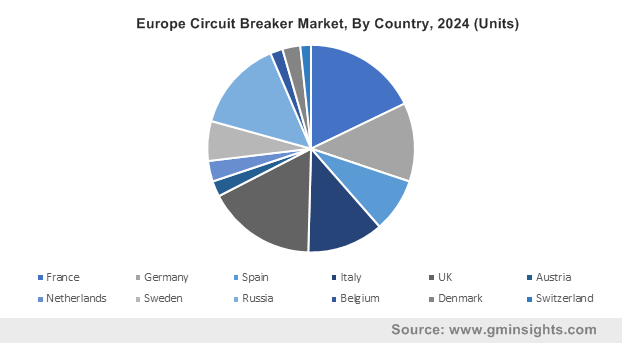 Global Circuit Breaker Market size in 2017 was valued over USD 13 billion and is anticipated to exceed an annual installation of over 40 million units by 2024. Operational safety and growing measures to integrate a reliable and sustainable electrical infrastructure will drive the global market. Developing Asian and African economies have been prone to frequent power lags and network failures, thereby the regions pose immense potential for the deployment of efficient electric products. In addition, increasing measures to curtail fire hazards, electrical supply faults and relevant operational dereliction will positively sway the industry dynamics. As smart grids and renewable electric networks pervade the industry peripherals, restructuring & revamp of the existing infrastructure demand safe & secure operations which in turn will foster the market share. In addition, large scale suburban migration has led to an exponential rise in energy consumption which in turn has reinforced the adoption of circuit protection equipment’s. Henceforth, positive regulatory & consumer inclination towards the integration of safe and secure electrical infrastructure will complement the overall industry outlook. 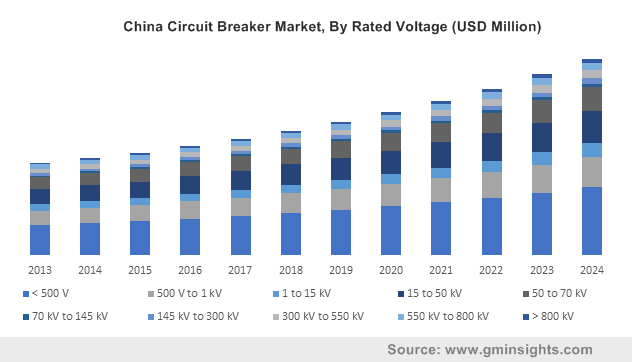 Ongoing rural electrification drives coupled with regulatory proximities toward the integration of distributed generation and stand-alone renewable networks will augment the low voltage circuit breakers market size. Introduction of smart product portfolios including ACB’s, MCB’s, MCCB’s and associated circuit protection equipment in line with energy efficiency protocols have further gratified the business landscape. In 2017, Manetos Lab, a Swedish firm proclaimed the development of their digital circuit breaker with an aim to avail direct replacements for electromechanical products. 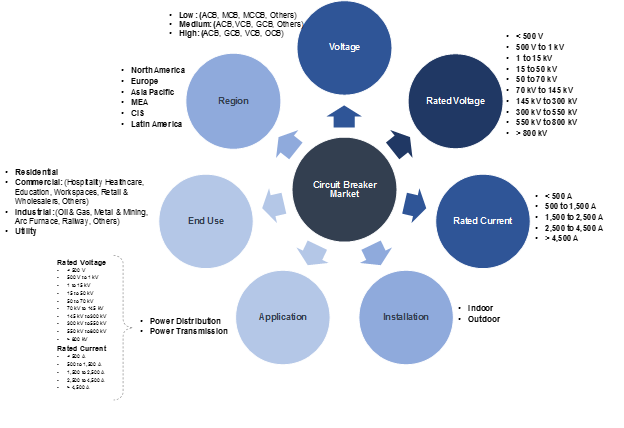 Expansion of power distribution infrastructure in line with increasing electricity demand across primary and secondary electric networks will foster the < 70 kV circuit breaker industry share. The introduction of micro-grid action plans favoured by regulatory proximities toward stand-alone renewable networks will further boost the product deployment. Rural electrification initiatives along with rapid urbanization across developing nations have further instituted a favourable business scenario. < 500 Ampere circuit breaker market is anticipated to exceed an annual installation of 30 million units by 2024. Rapid industrialization along with rising dependency on manufactured goods have led to extensive expansion of freight and good carrying railway infrastructure. Deployment of rail electric networks coupled with large scale industrial expansion will favour the business prospects. In addition, ongoing commercialization in line with positive economic proximities across developing economies will further boost the product adoption. 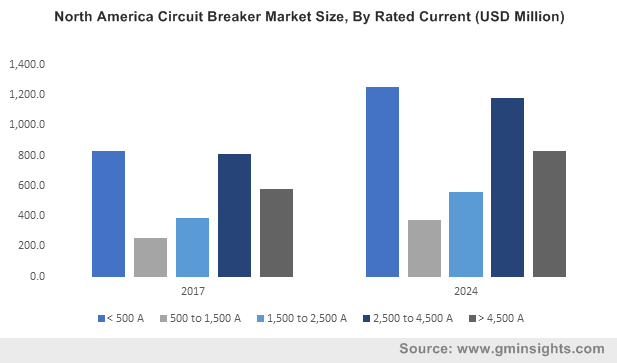 Increasing emphasis towards the expansion of varied frequency electric distribution networks coupled with rising concerns to integrate an energy-efficient operational environment will drive the indoor circuit breaker industry size. Increasing demand for stand-alone power networks along with streamlined R&D investments from leading industry participants to integrate versatile & advance product portfolios will foster the product demand. In addition, accruing demand for self-governed private substations across educational institutions and associated commercial establishments will positively sway the industry dynamics. Upsurge in infrastructural investments subject to pervasive residential & commercial establishments will drive the power distribution circuit breaker industry size. Refurbishment & retrofit of aging electric infrastructure along with the rapid integration of smart control & monitoring distribution units will augment the product demand. Government of Serbia in coalition with Chinese regulators proposed plans to modernize the Serbian traditional power distribution infrastructure. In 2017, regulators have further proclaimed, flow of investments to hover across USD 6 billion entailing infrastructural enhancement across the nation. Utility owned circuit breaker market is expected to grow over 7% by 2024. Favorable regulatory electrification plans favored by stringent energy efficiency protocols will escalate the smart electric substation industry outlook. Positive inclination towards the deployment of smart grid and control networks favored by rapid expansion of primary & secondary distribution infrastructure will augment the industry landscape. In addition, ongoing intervention of large industry participants across utility aided grid infrastructure in coalition with local DISCOMs have further integrated a favorable business scenario. The U.S. market is projected to value over USD 3 billion by 2024. Positive regulatory inclination towards the retrofit & replacement of the traditional electrical equipment with advance units will fuel the product demand. Regulators across the U.S. in 2018, have framed plans to invest about USD 10 billion to develop & enhance the domestic electric infrastructure, with an aim to minimize the curtailment rate across their Western Transmission Network. Asia Pacific market is anticipated to witness growth over 8% by 2024. Developing nations including India pose favourable growth prospects as they continue to expand their existing power generation capacities and supply infrastructure to meet the rising electricity demand. The Government of India in 2016, launched the “One Nation; One Grid & One Price” initiative to interlink all the state and national grid with an aim to achieve a single tariff structure across the nation. Prominent market players comprise of ABB, Schneider Electric, Eaton, Mitsubishi, Toshiba, Siemens, Hitachi, Crompton Greaves, Powell Industries, Hubbell, Fuji Electric, Meidensha, TE Connectivity, BEL Fuse, L&T, and Mersen S.A.
Development of versatile product configurations coupled with the integration of extensive product portfolios have been the key strategies witnessed across the industry peripherals. In addition, extensive R&D investments along with organic & inorganic strategic alliances have also been adhered by the leading industry participants. Circuit breakers are automatically operated electrical switches, designed to safeguard an electrical network from the damage induced by excess current from short circuit or overload. The basic function of the circuit breaker is to interrupt current flow on fault detection.